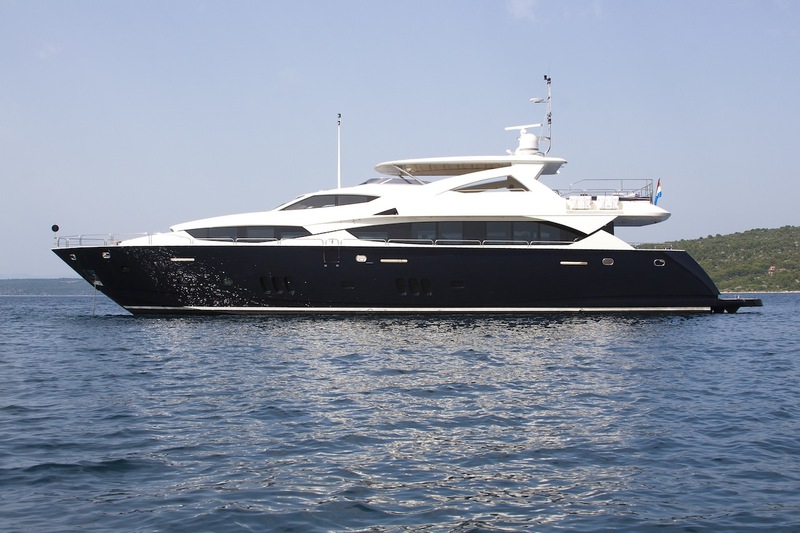 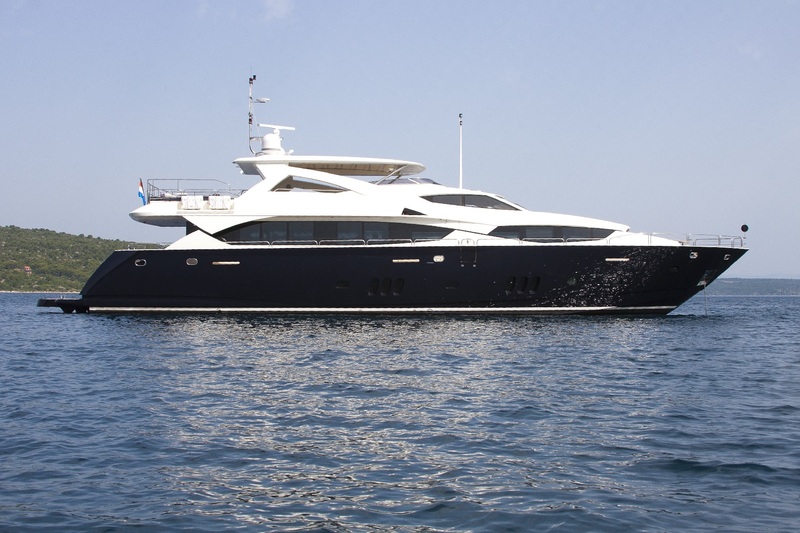 Motor yacht CASSIOPEIA is a Sunseeker 34m (111' 6") superyacht launched in 2009. 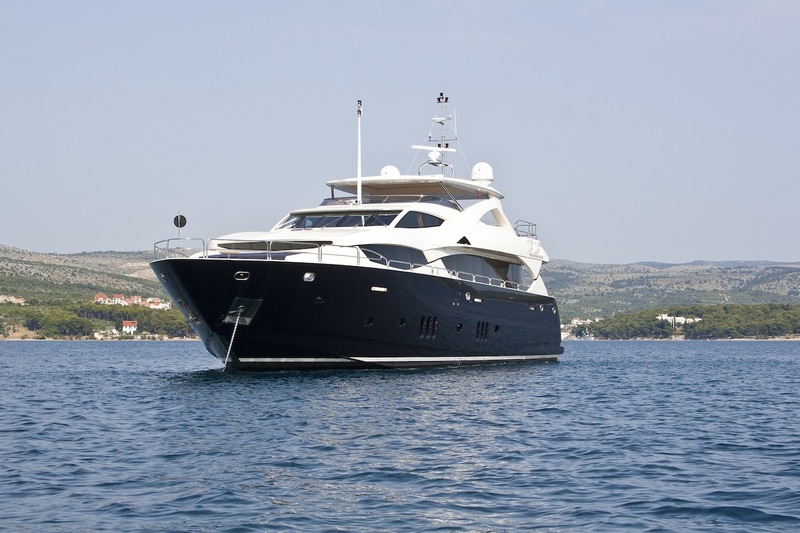 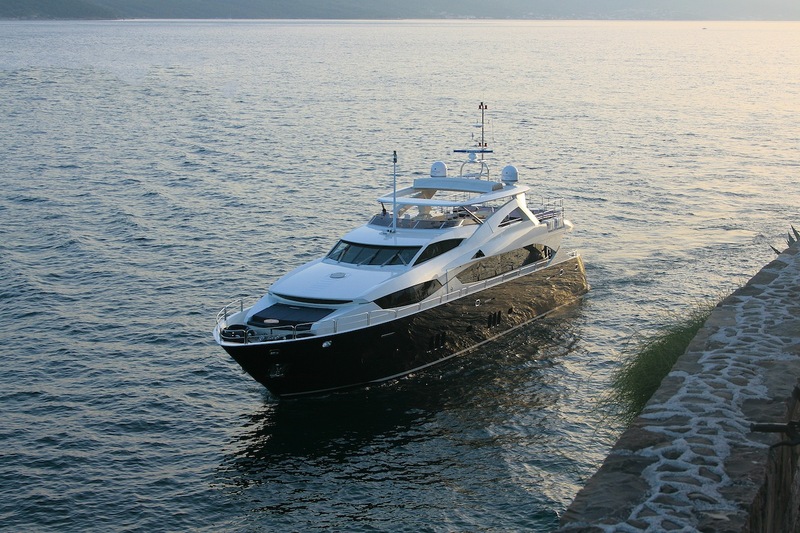 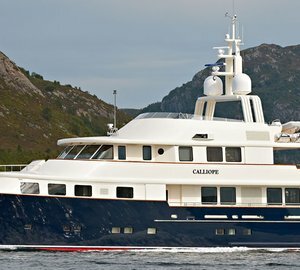 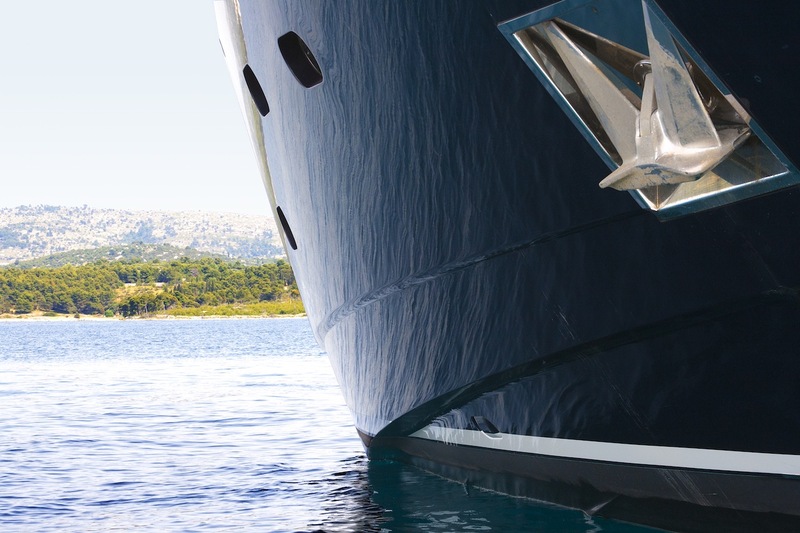 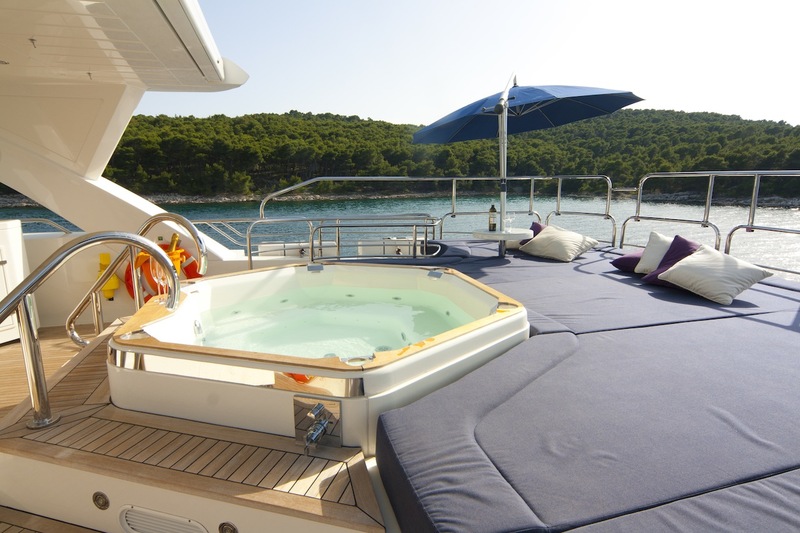 She sleeps up to 10 charter guests in 5 cabins, and she cruises with up to 12 guests onboard. 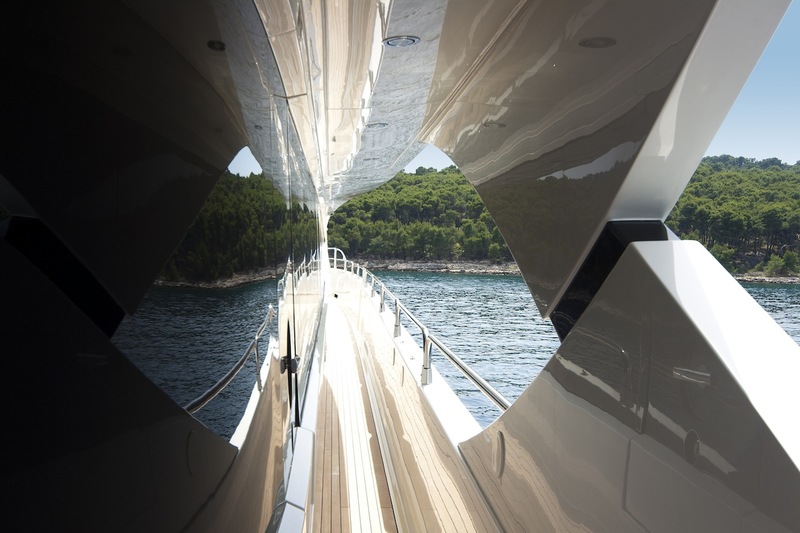 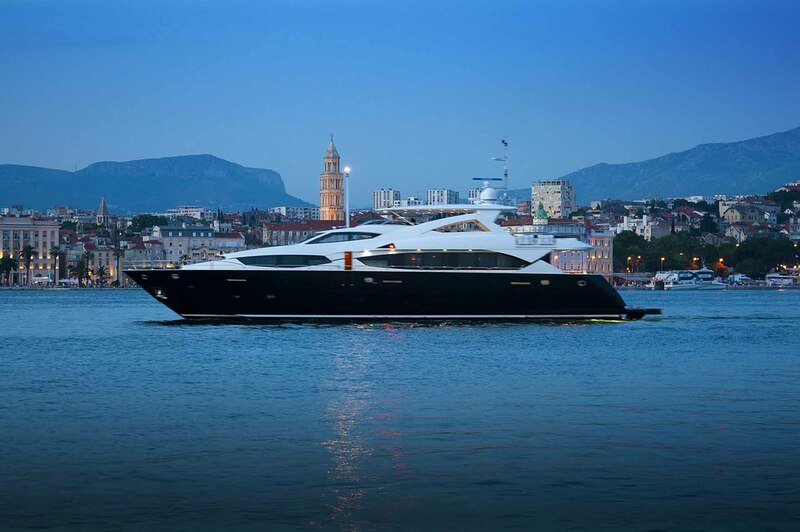 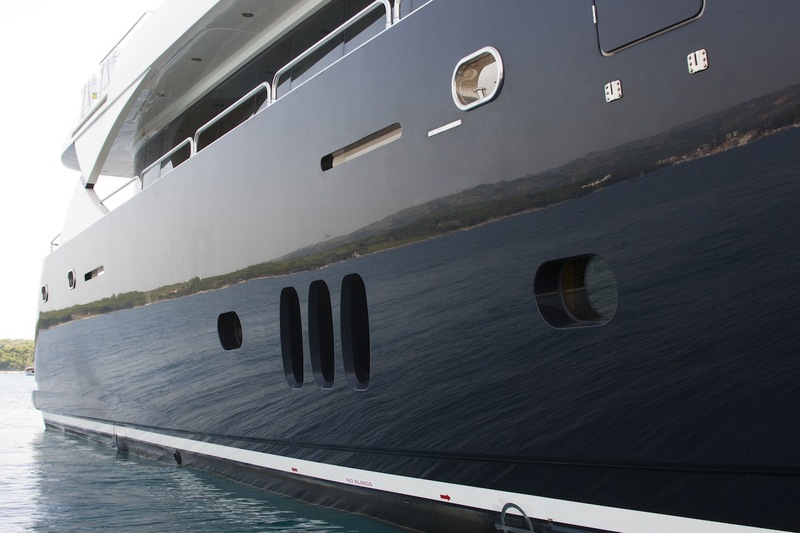 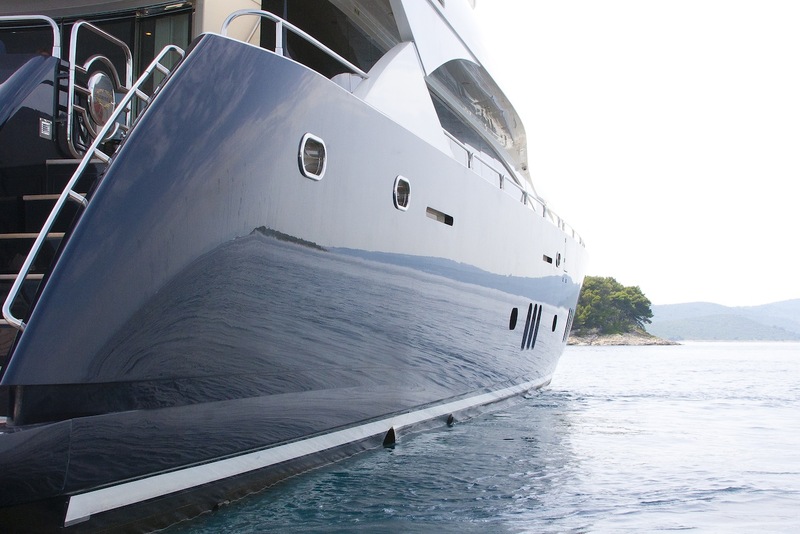 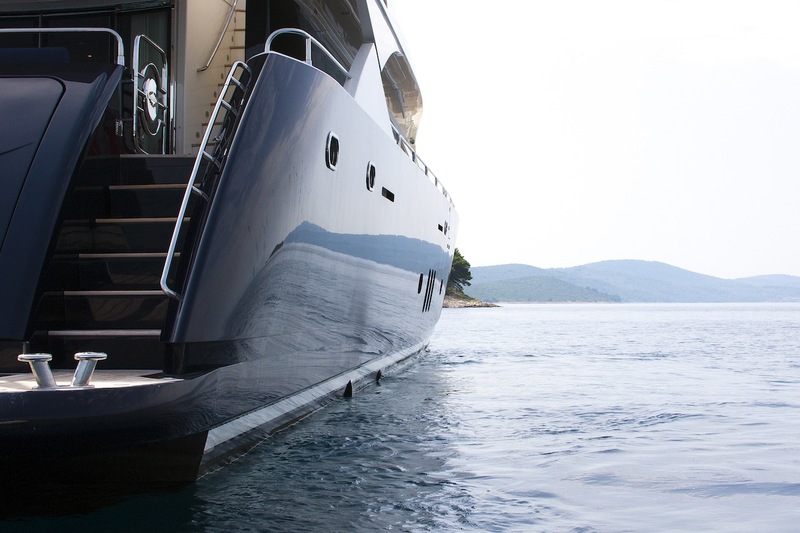 Breathtaking scale and classic flowing lines give this yacht unmistakable countenance on the water. 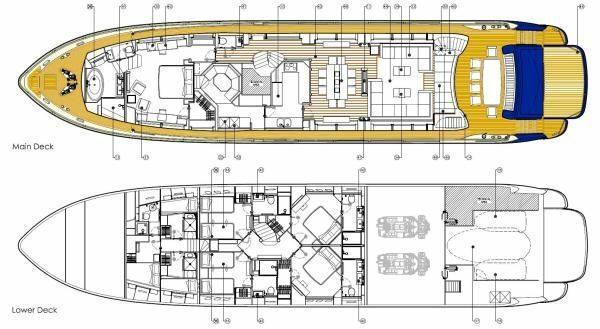 In many respects not much smaller than her larger flagship sister, three capacious decks provide opulent entertainment areas and generous accommodation, based on an entirely new hull. 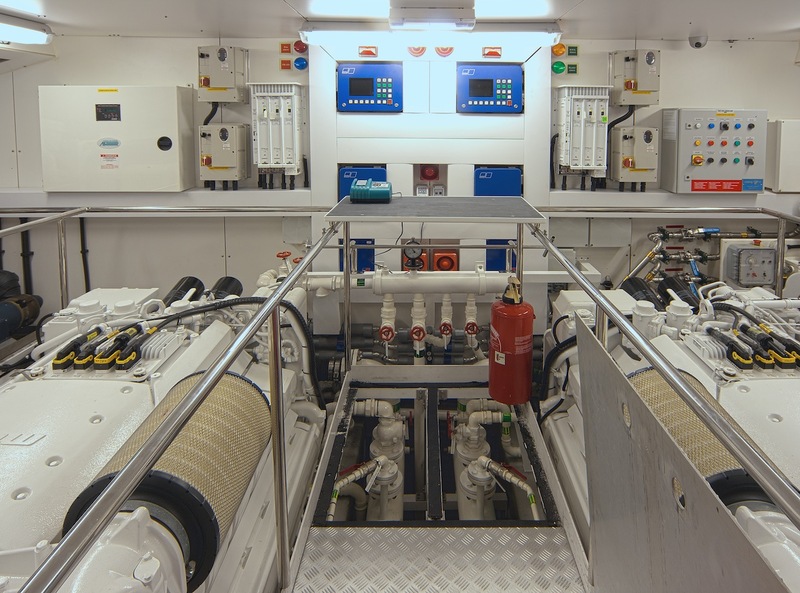 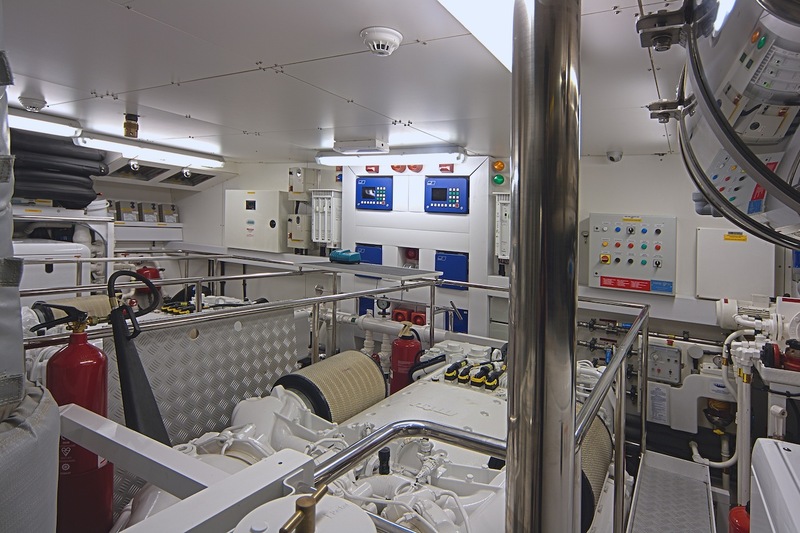 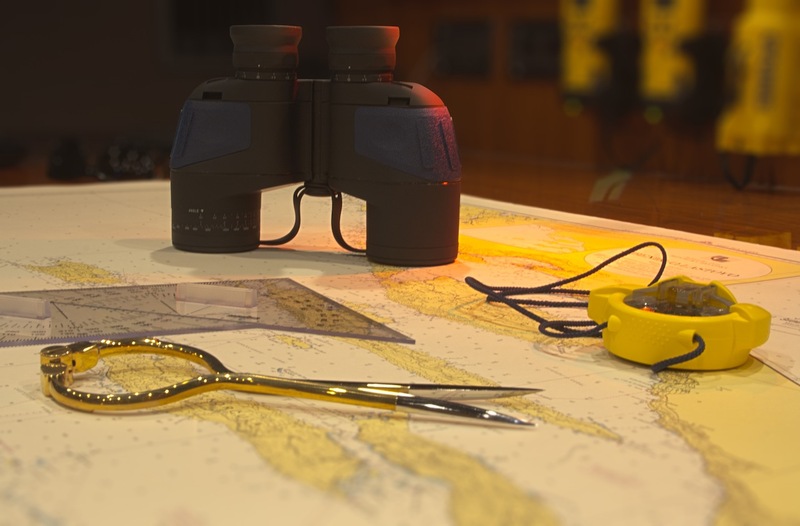 Other great features include excellent infrastructure, with the crew and guest separation scheme throughout the vessel. 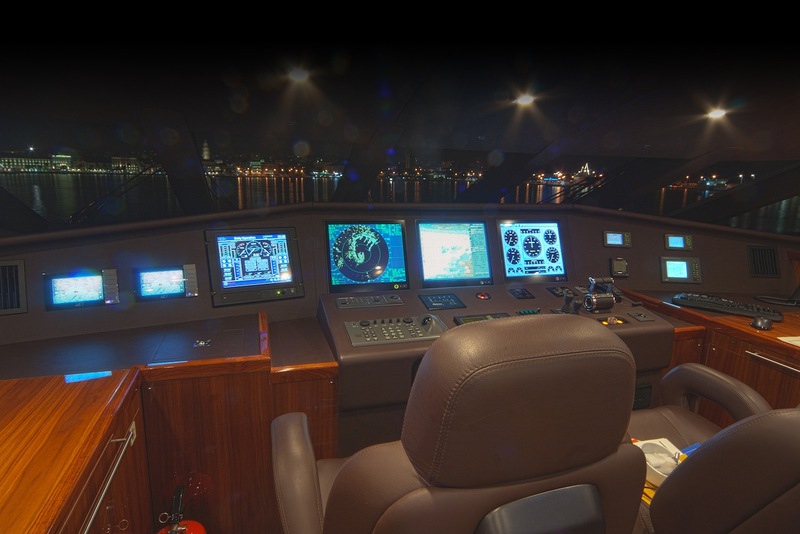 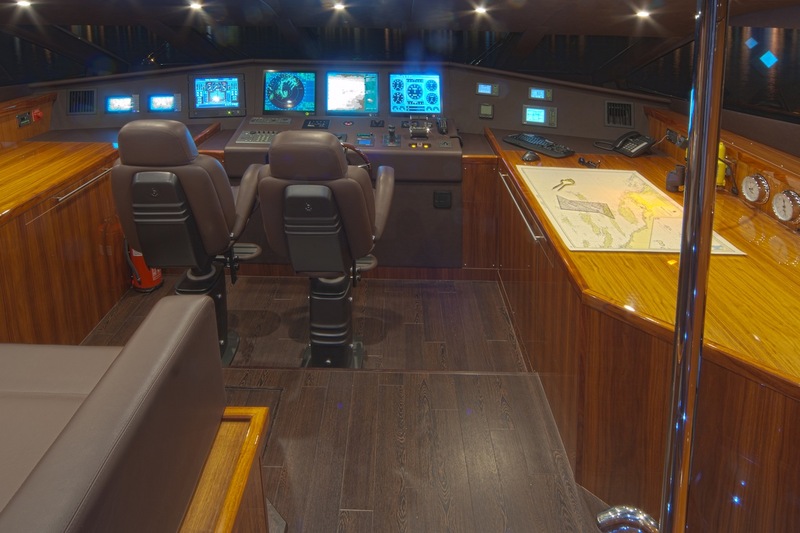 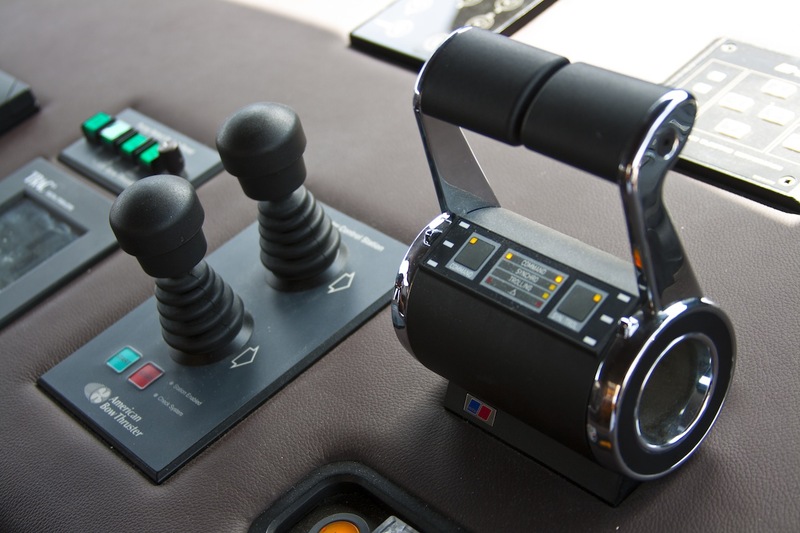 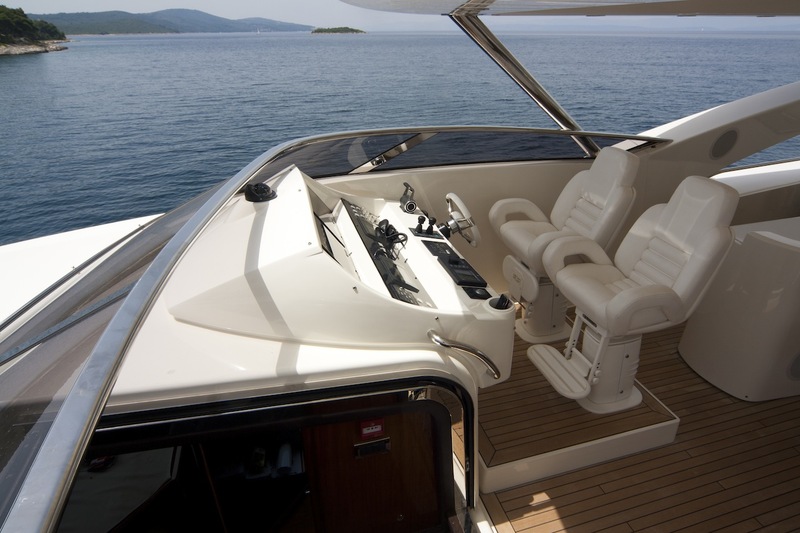 There's also the impressive flybridge - this time with a second helm station. 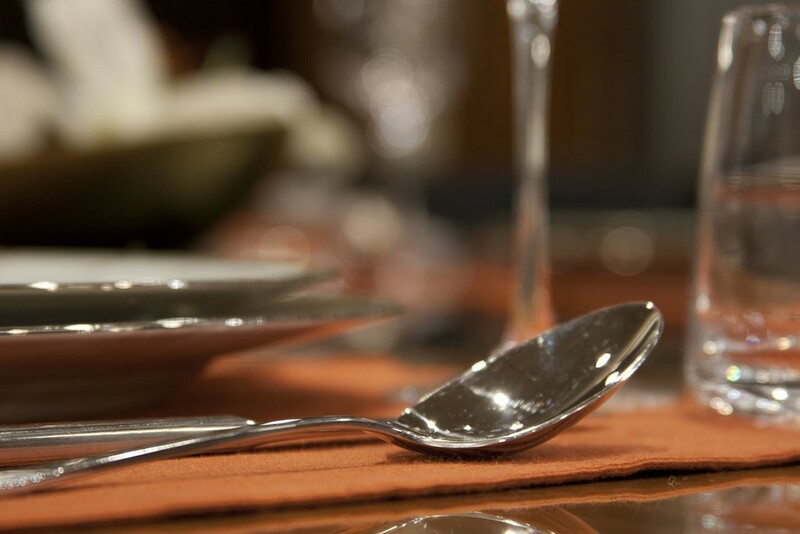 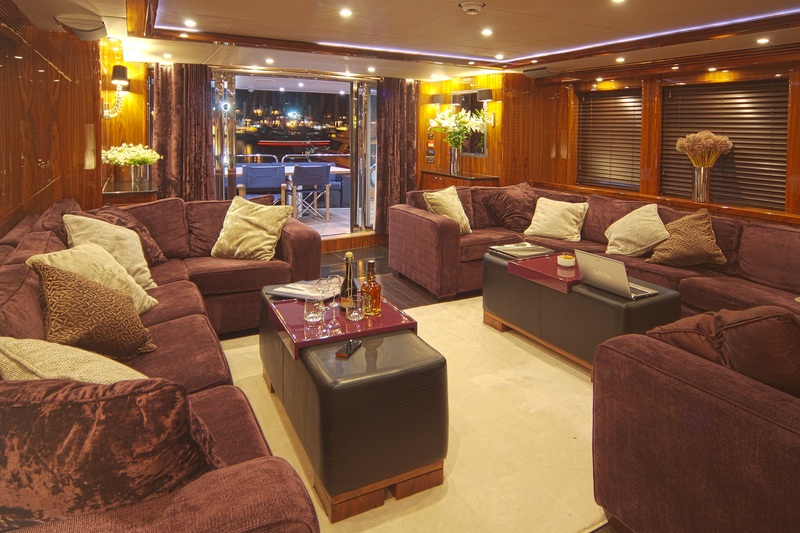 The main salon is open plan, with elegant lounge and dining areas. 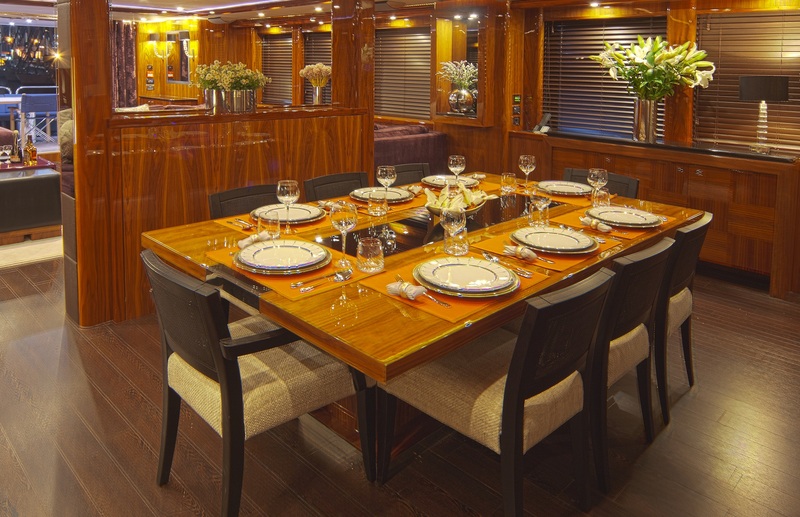 The formal dining table is perfect for 10 guests who can also enjoy some great panoramic views through large side windows of the salon. 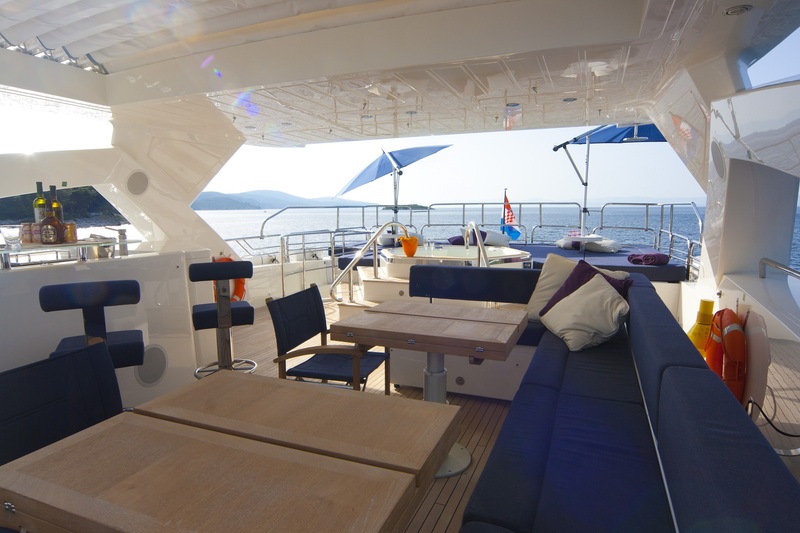 The upper deck offers a more casual ambiance, where the guests can relax in the ample seating area with a cuppa or sip on some cocktails. 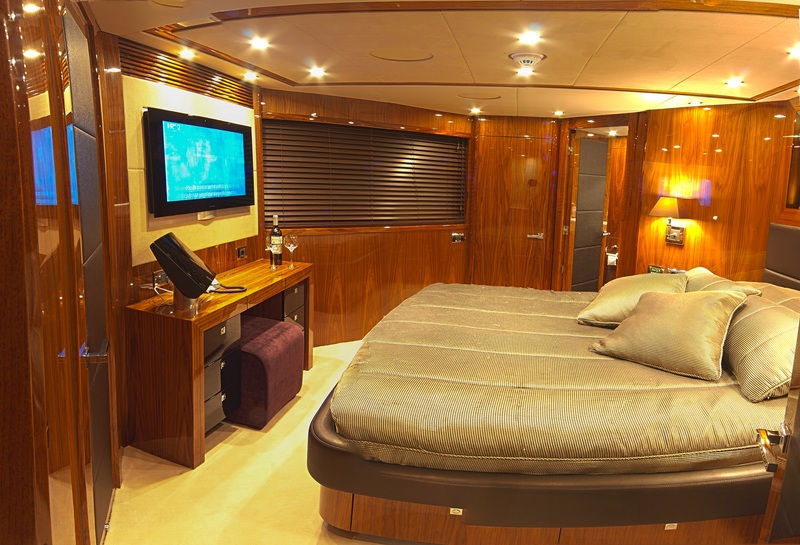 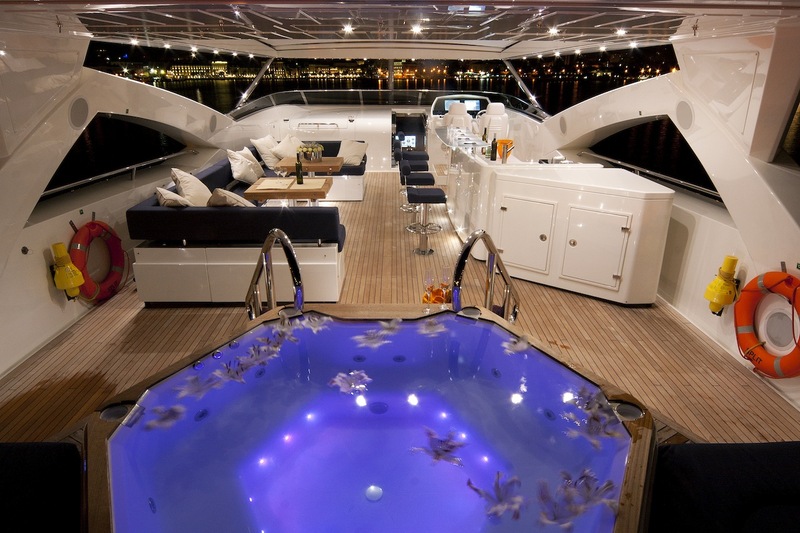 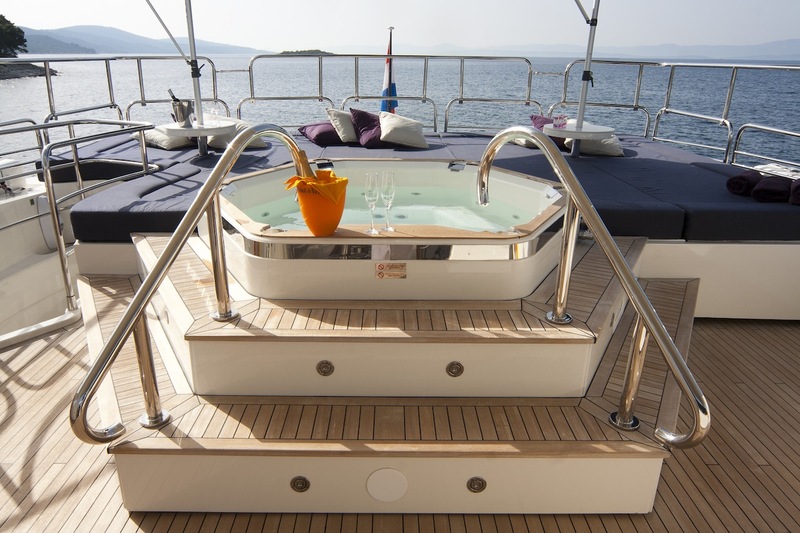 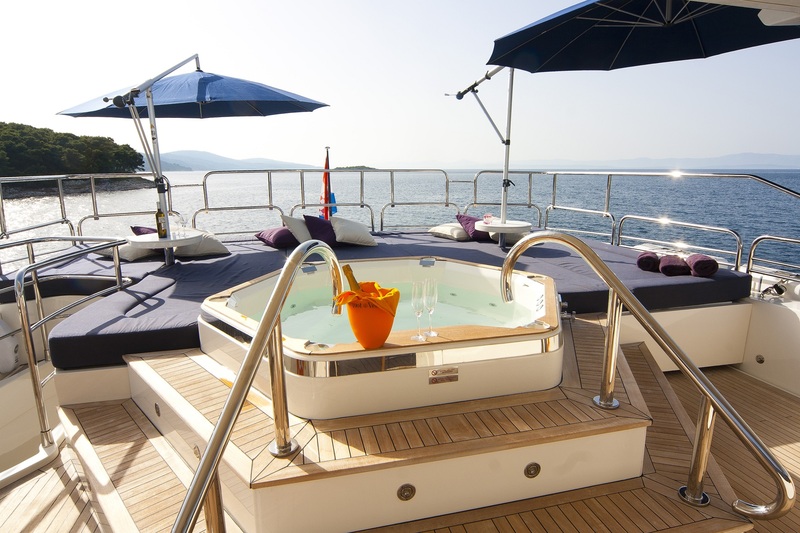 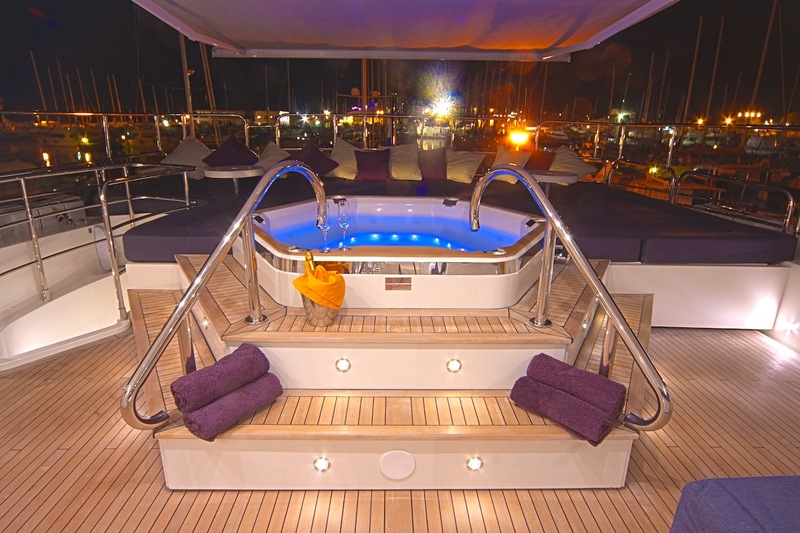 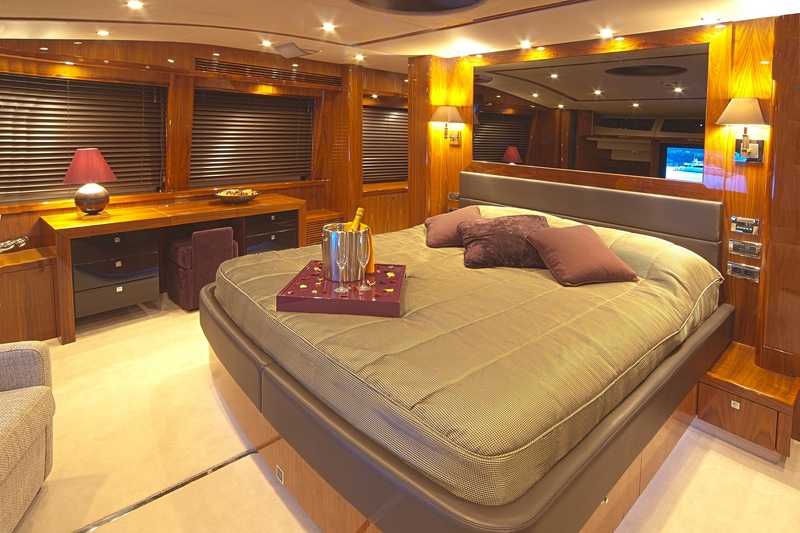 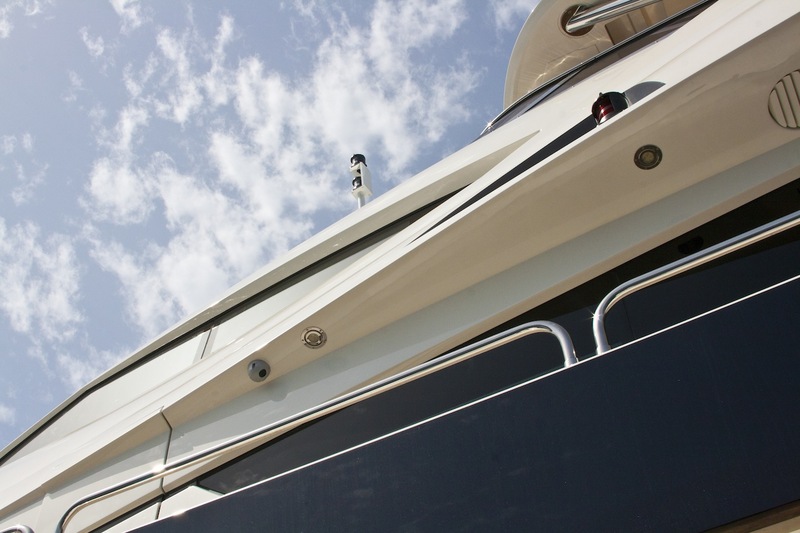 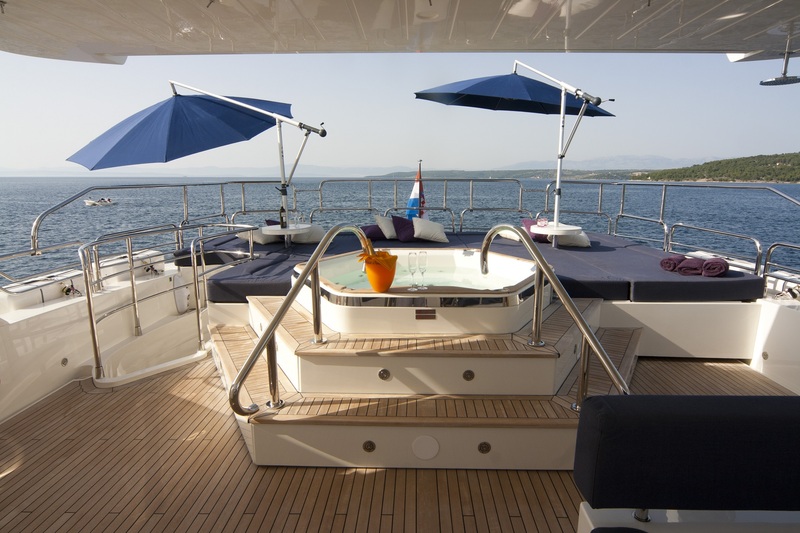 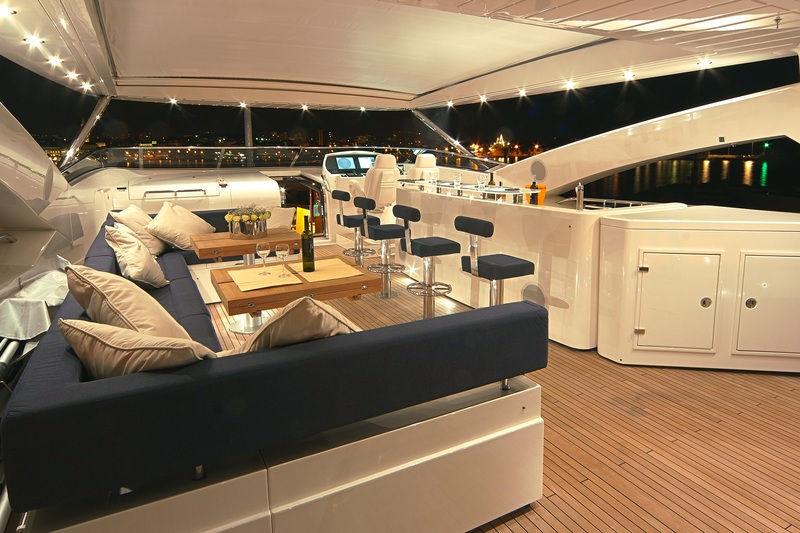 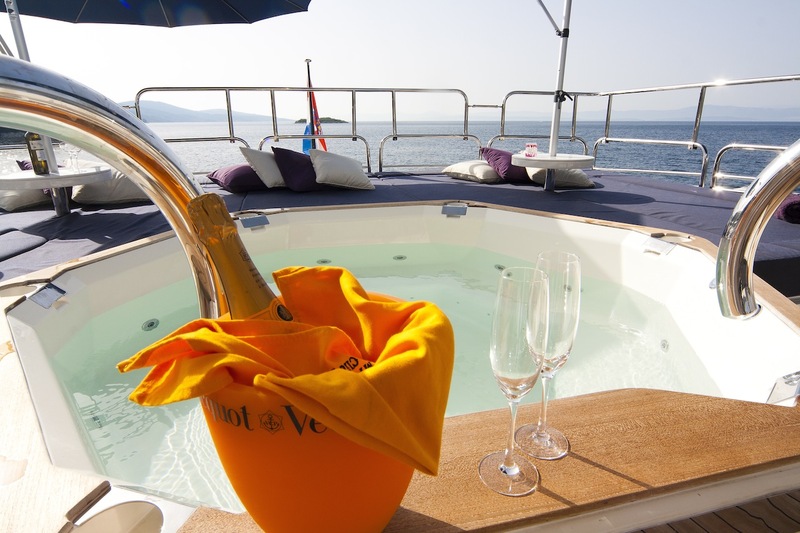 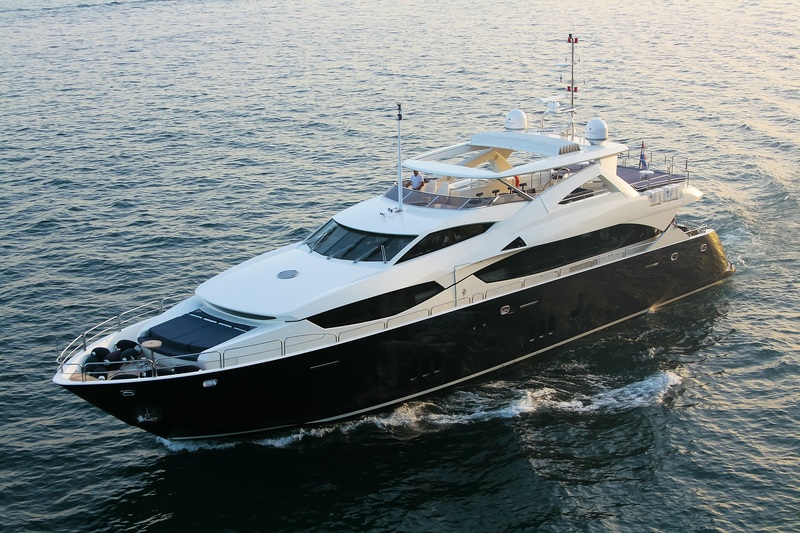 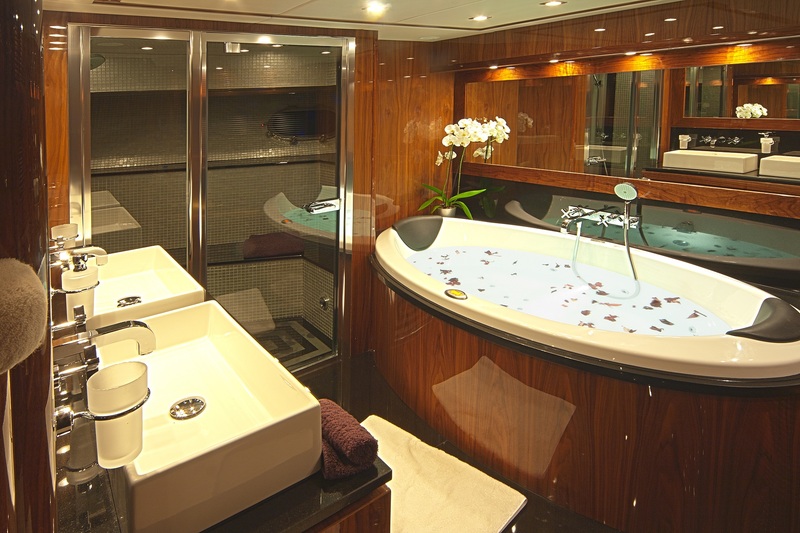 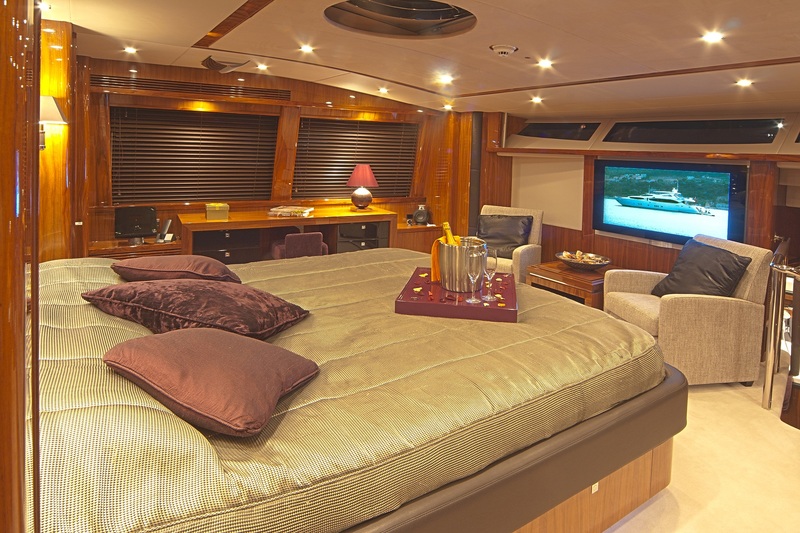 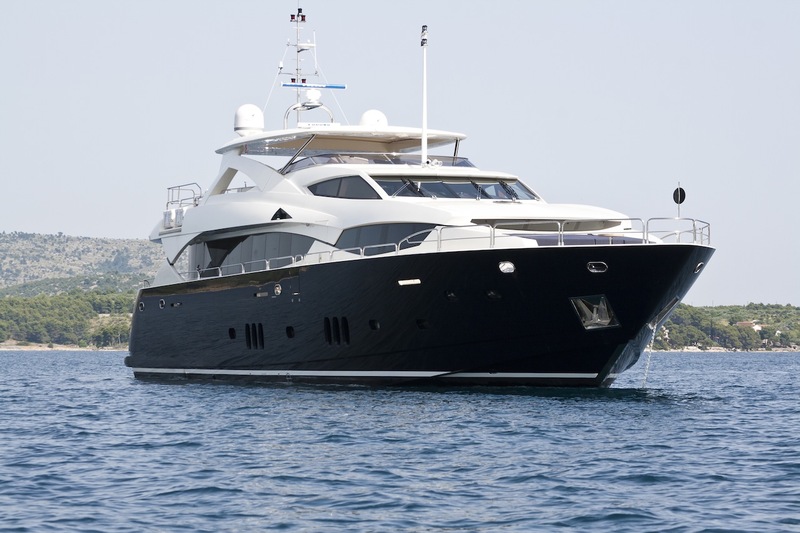 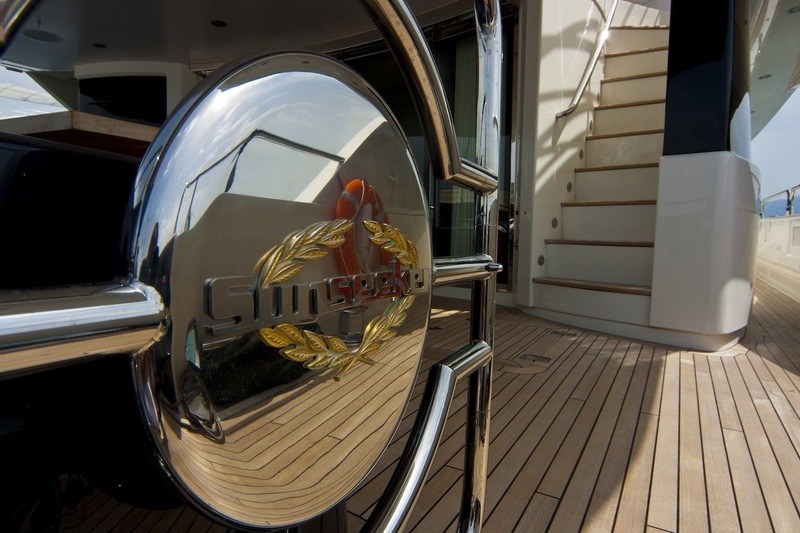 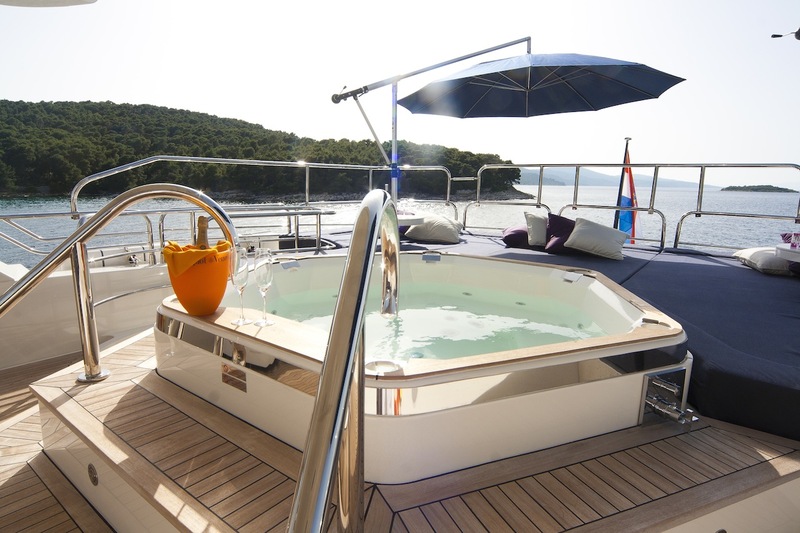 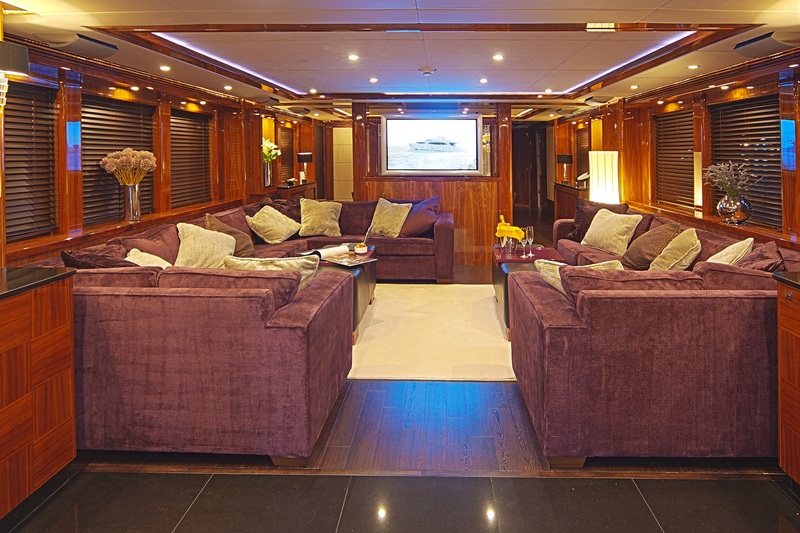 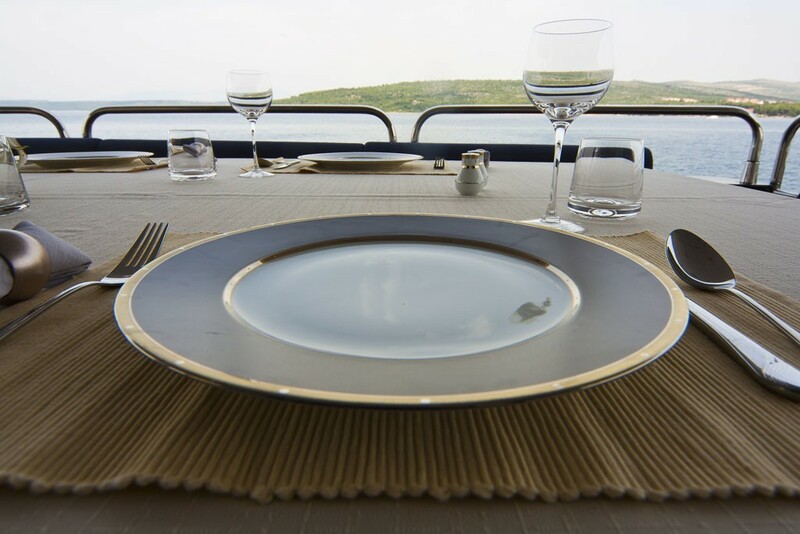 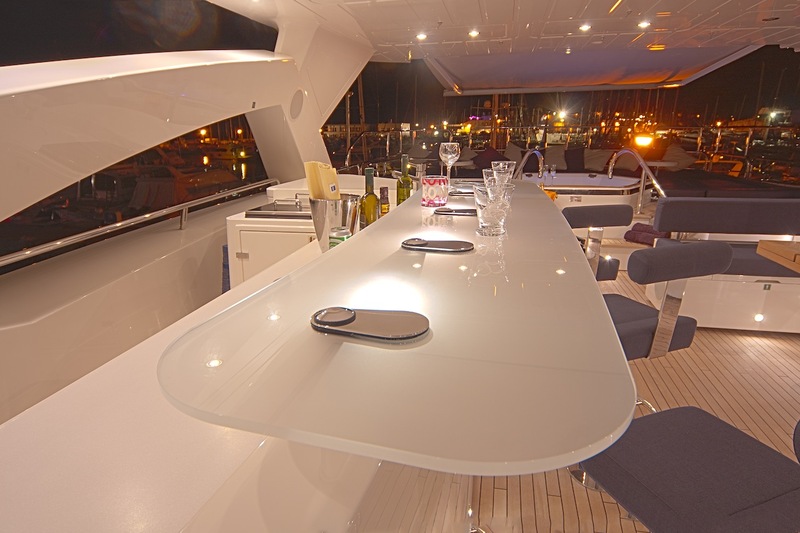 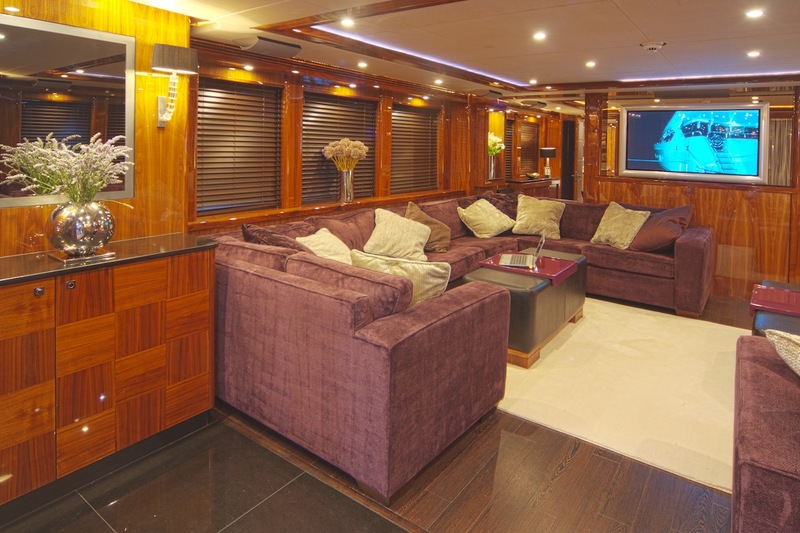 There is also Jacuzzi, wet bar and alfresco dining area that add to the number of some excellent amenities on board. 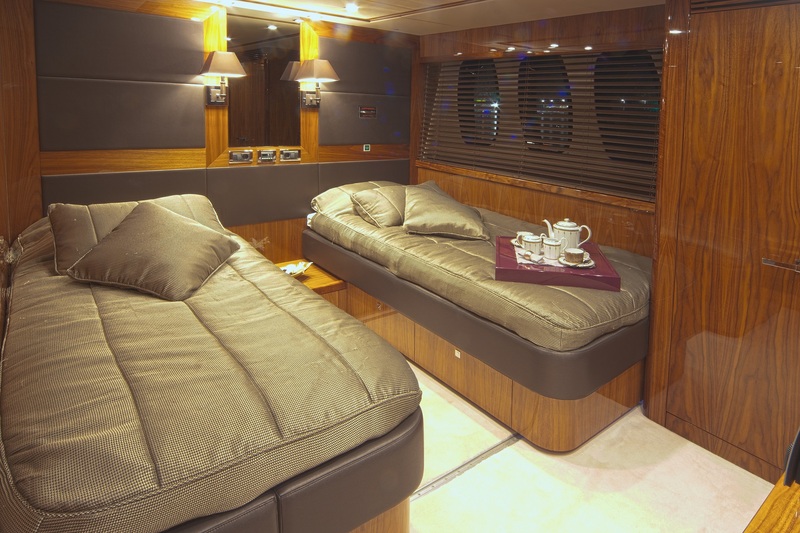 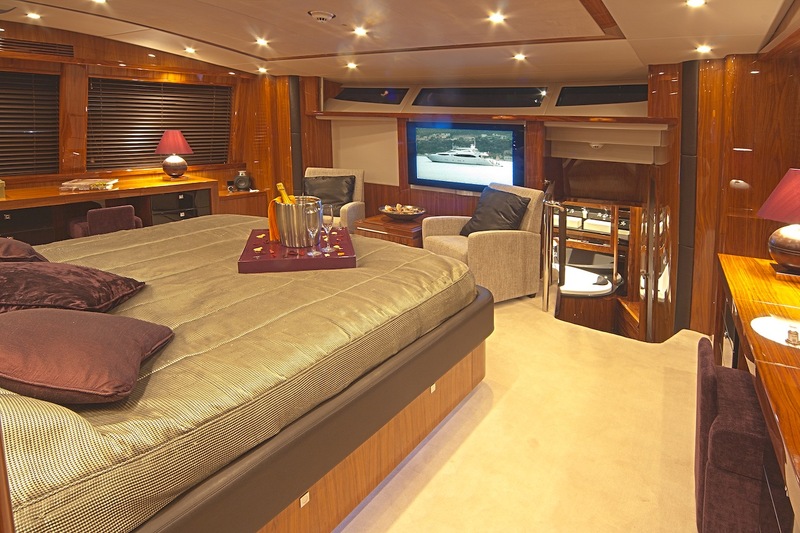 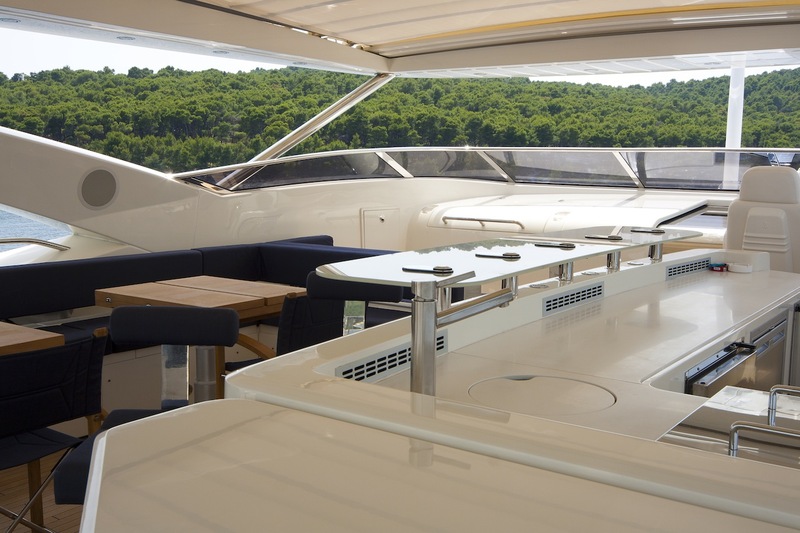 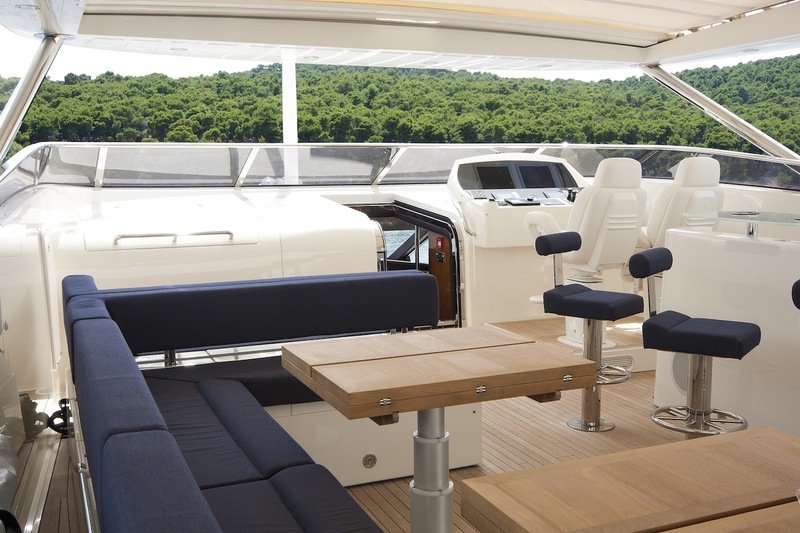 Plenty of seating and sunbathing space is offered on the flybridge. 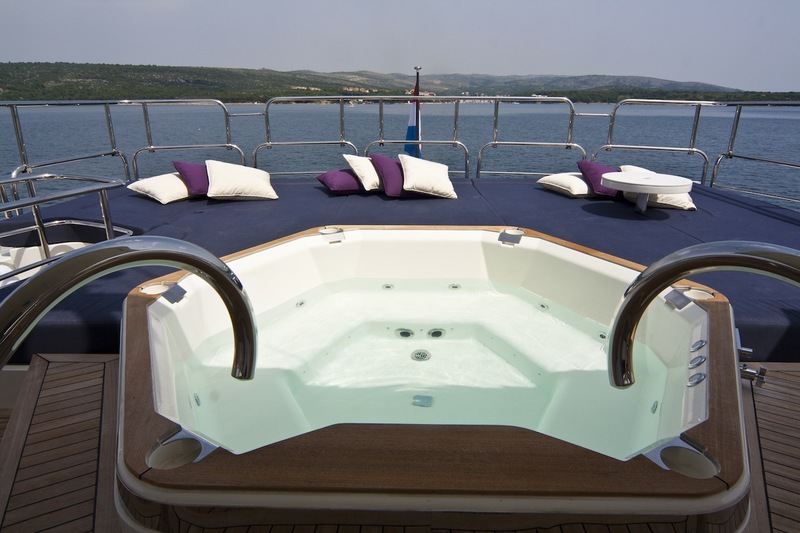 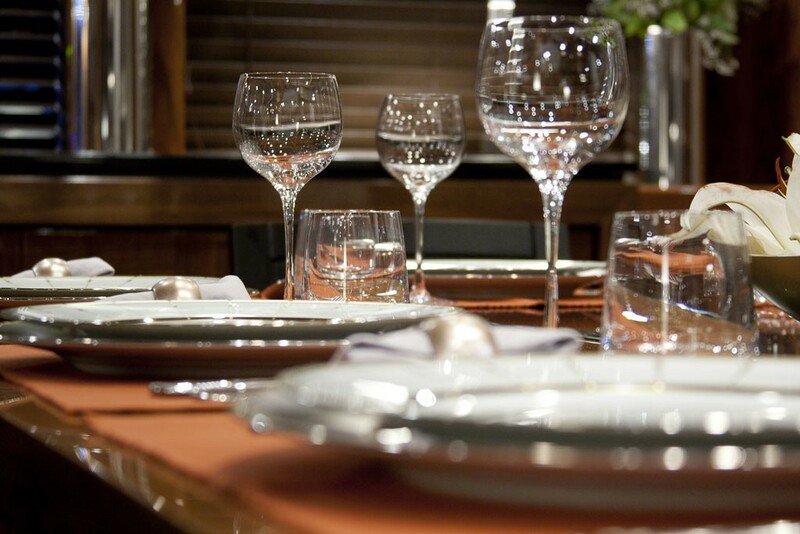 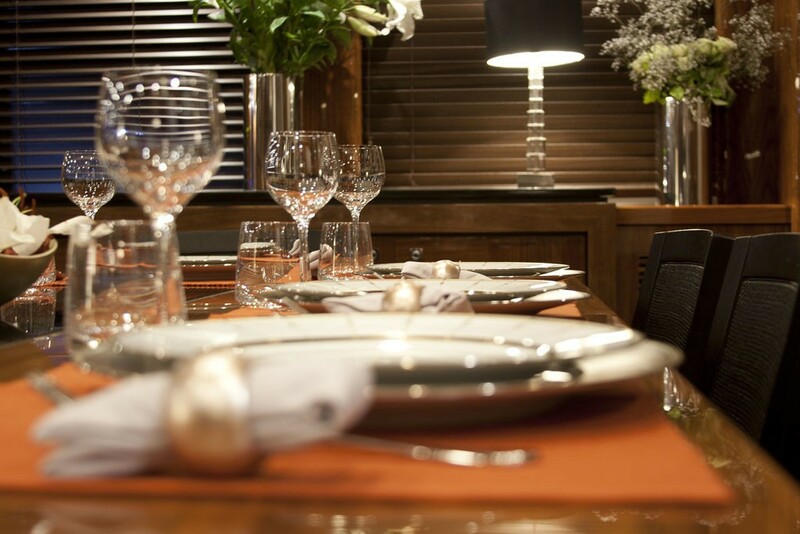 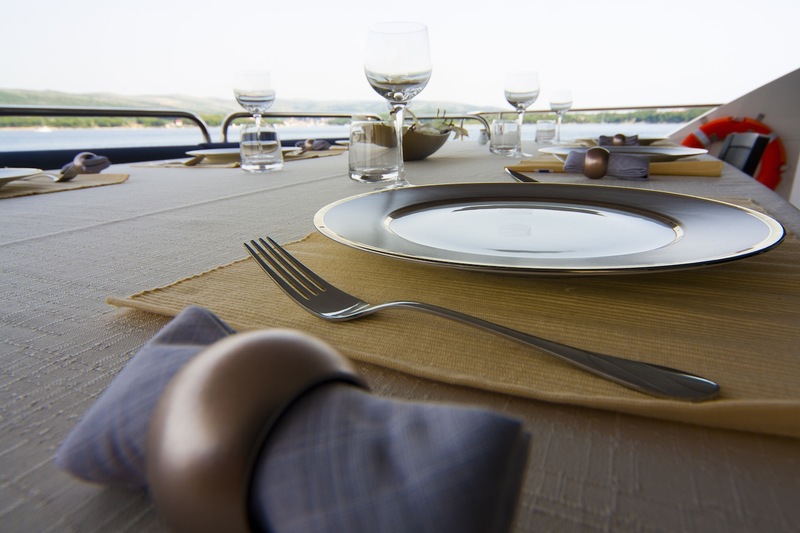 CASSIOPEIA accommodates 10 guests in 5 lovely cabins. 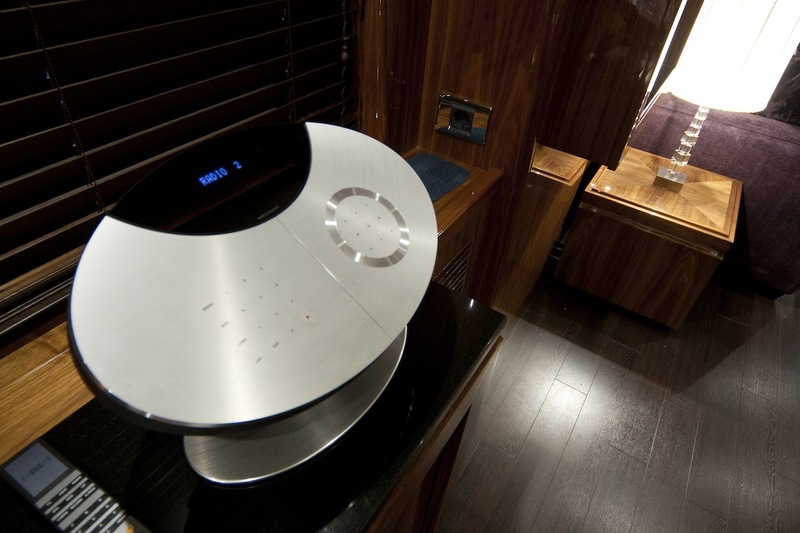 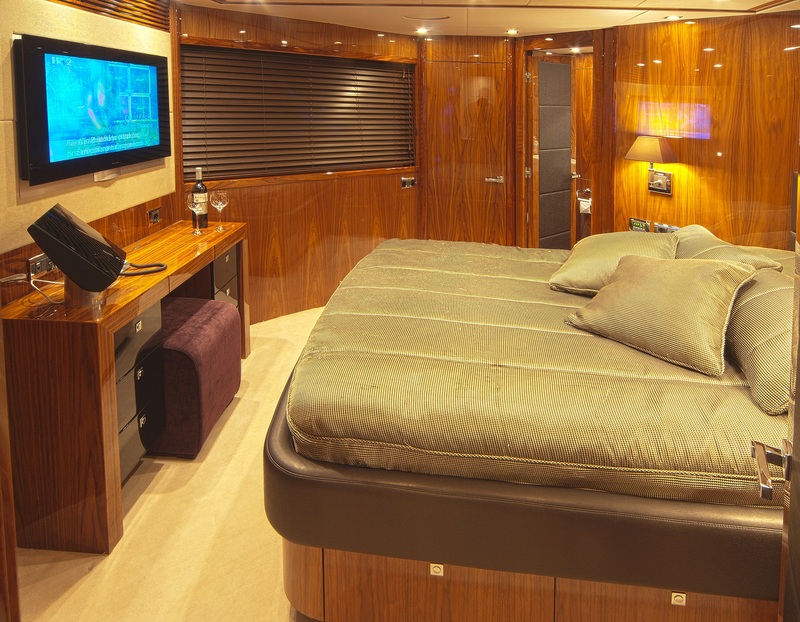 The master stateroom features a walk-in wardrobe, ensuite facilities and fantastic 180-degree visibility. 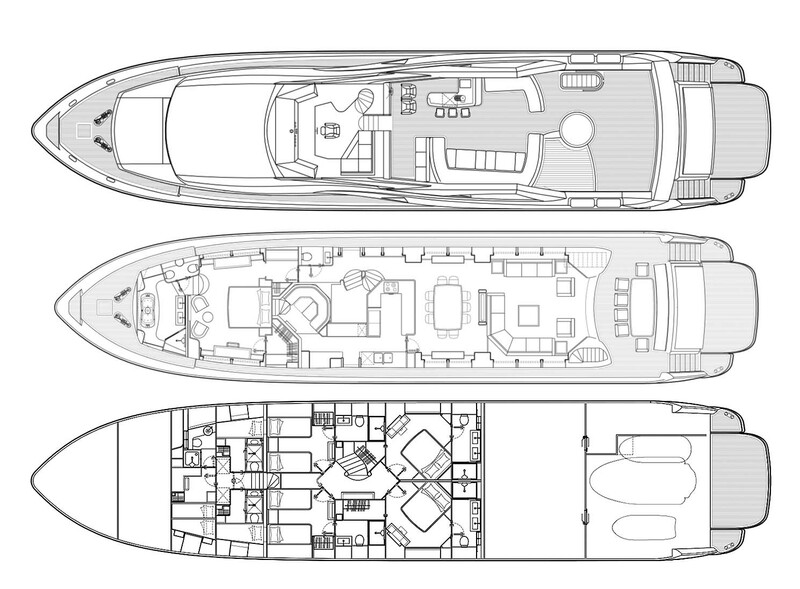 There are also two VIP and two twin cabins. 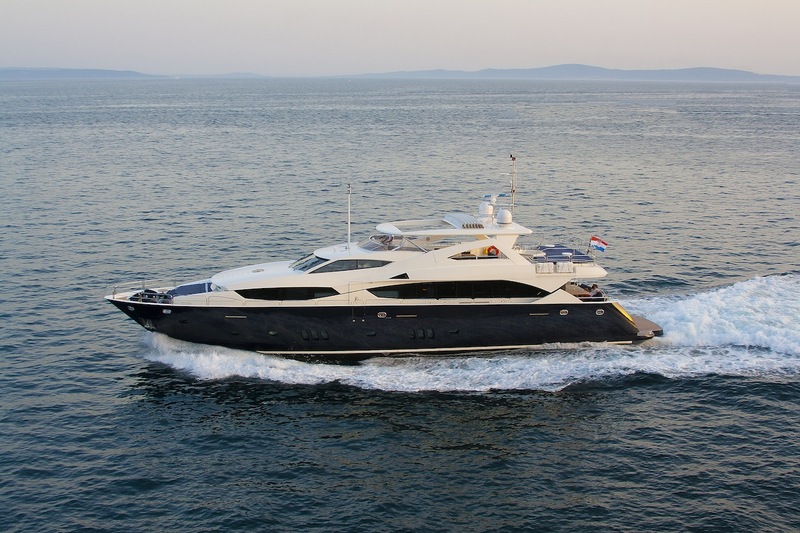 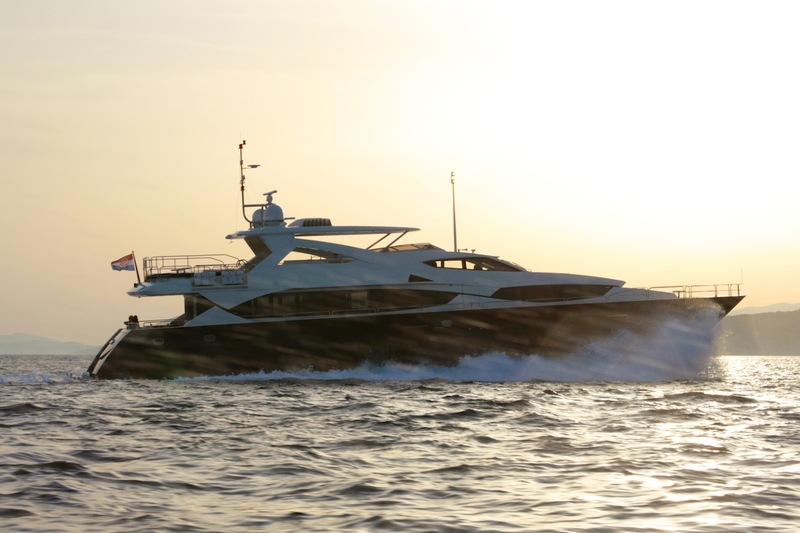 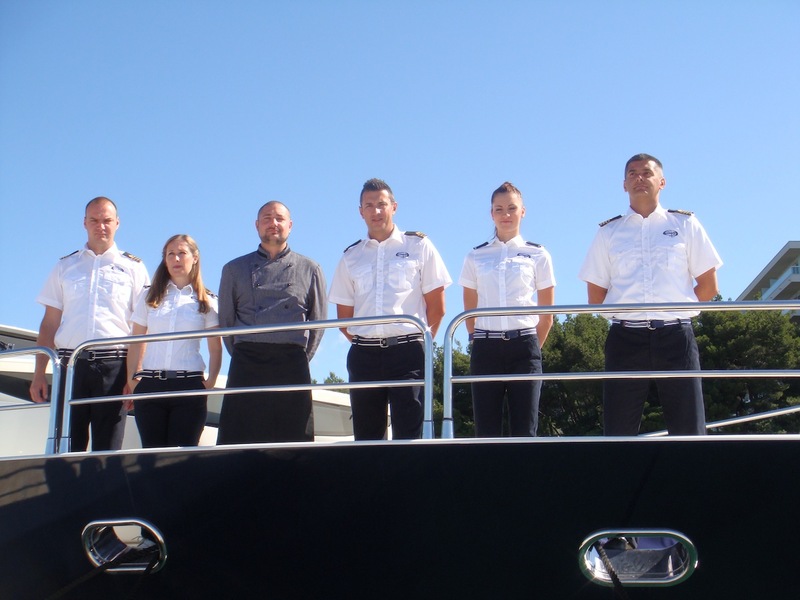 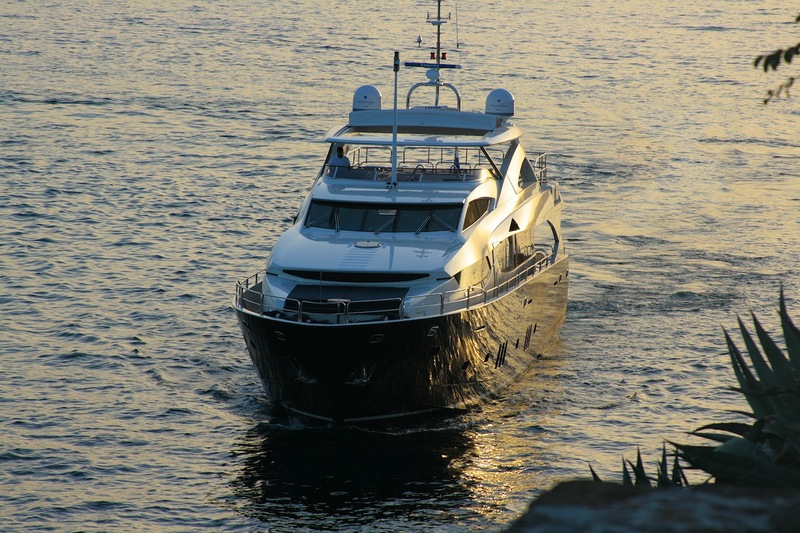 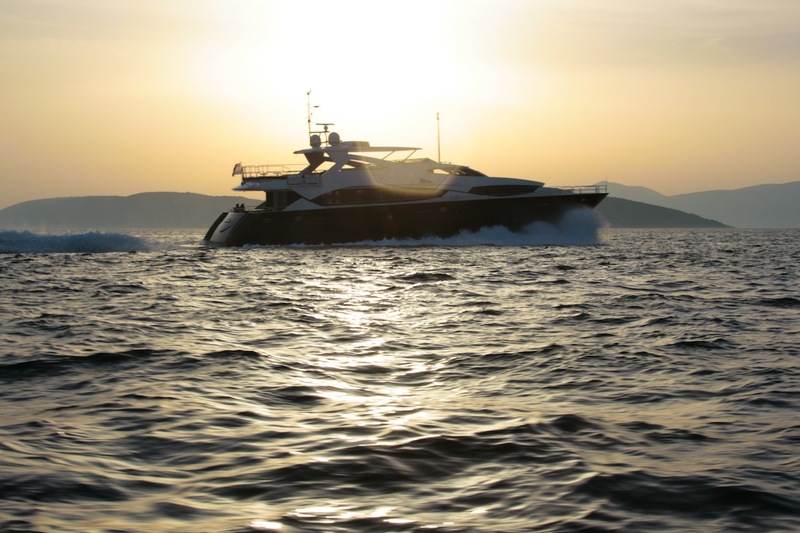 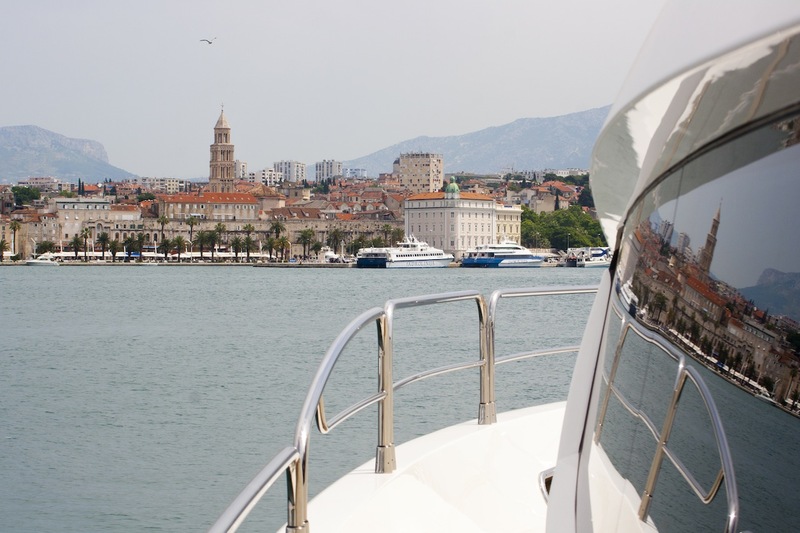 Powered by twin MTU engines, this yacht can reach a top speed of 25 knots and cruises comfortably at 18 knots. 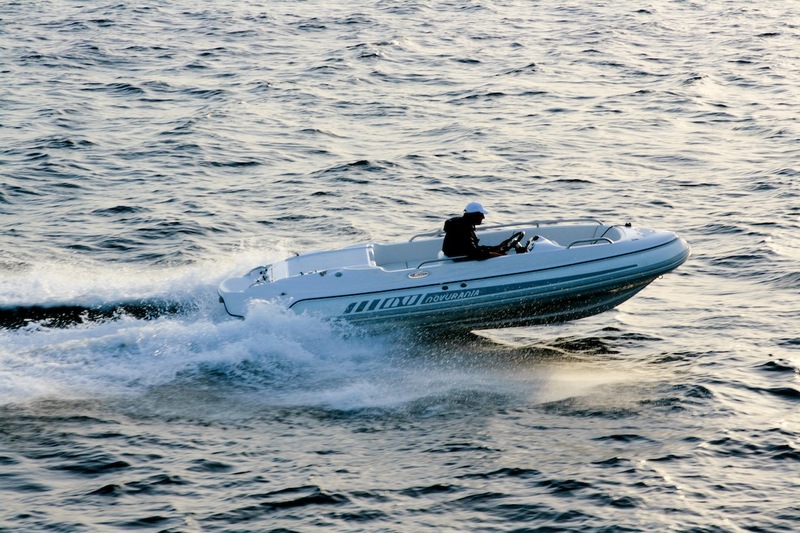 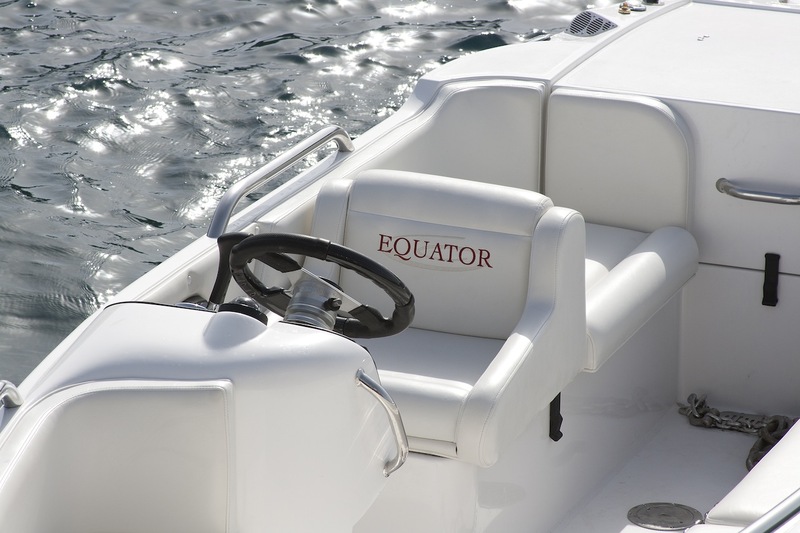 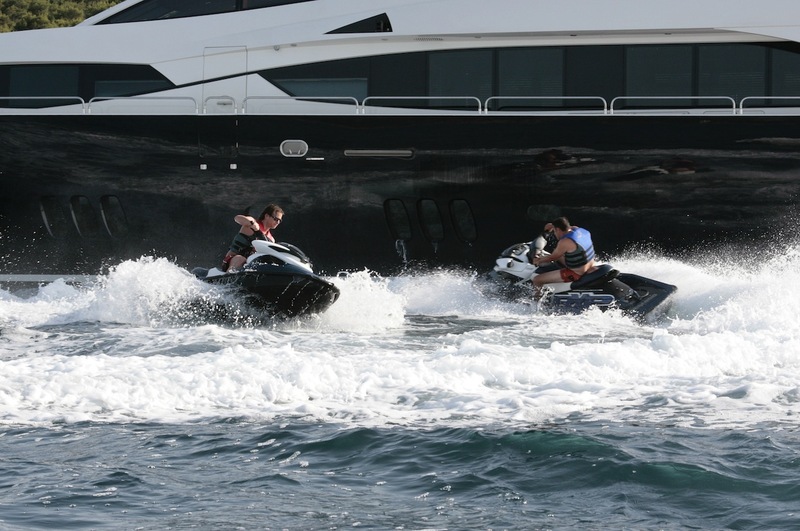 Tenders & Toys: ~1 x Novurania Equator 5.40 m with 190 BHP Volvo Engine (2010) ~2 x Jet ski Sea Doo 215 BHP (2014) ~2 x Kayak windsurf ~2 x Inflatable kayak ~2 x Donut ~1 x Fly Board ~3 x Sets of diving gear (RDV ONLY) ~Sea doo (underwater scooter) ~Wakeboard ~Banana Audio Visual Equipment and Deck Facilities: ~Cinema Surround Sound TV ~LCD TV in Saloon Communications: ~There is WiFI and GSM phone on board.